We supply thermostatic water bath. These thermostatic water baths are double walled made with high quality heavy guage stainless steel. The gap between the inner and outer walls is insulated with fine quality glasswool. The bath is fitted with immersion heater. 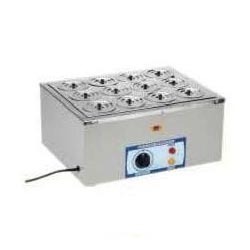 Temperature is controlled by a thermostat from ambient to 90 deg C.
Rectangular water bath, double walled construction, insi de reservoir of stainless steel, outer body mild steel with insulation in between, supplied with lid having one hole of 12.5cm diameter and four holes of 7.5cm dia. Concentric Rings with lids are provided on holes. The top plate and concentric rings are of S.S.
Owing to the years of industrial experience, we have been able to serve our valued clients with a wide range of Thermostatic Water Baths. 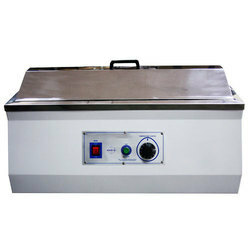 The temperature range of the water bath is from few degree C. above room temperature to 100 deg. C with an accuracy of 0.5 deg. C. This bath is suitable for the Washer man, Kolmer and Khan Test inactivation, Paraffin Embedding and many other applications in the laboratories. Temp. range: Ambient: +-5 to 95 deg. C. Accuracy +- 1 deg. C.
1. Power off recovery function. 2. Audio and visual alarm. 3. Stainless steel lid, prevent heat loss and evaporation. 1. Stainless steel inner chamber and upper cover. 2. Adopt new design structure, which could avoid the leakage of steam. 3.PID Mircoprocessor controller, LED display. - Agglutination as well as most serological, Pharmaceutical and biomedical procedure. - Thermostatic Water Bath is a double walled chamber made of SS and outer made of MS with powder coating. - The gap between the inner and outer chamber fines with special grade glass-wool insulation to avoid the heat loss. - Concentric rigs can be removed to accommodate containers of Various sizes.